Panther Beach is sandy and picnicable and at the same time it’s also rugged and wild. A nifty stone arch allows for some steep, uninhibited bouldering as well as something cool to look at. Low tide is best unless you want to boulder over the water so check a tide chart before heading out. The sandstone is barely solid enough for climbing and the hand and foot holds are mostly covered in a layer of sand, but the soft, sandy landings and crashing waves give it a fun vibe never the less. A few traverses and hang and drop problems are along the base of the big cliff around the arch. 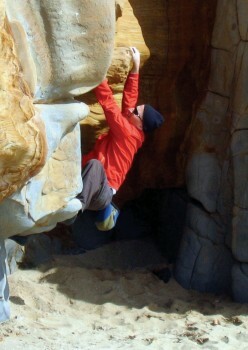 Sharma is said to have bouldered on this wild and exciting beach when he was living nearby. I reckon the good sandy landings combined with the loose sandy holds helped nurture his carefree, go for it style. Which SuperTopo guidebooks cover Panther Beach? Mike Whipple at Panther Beach.